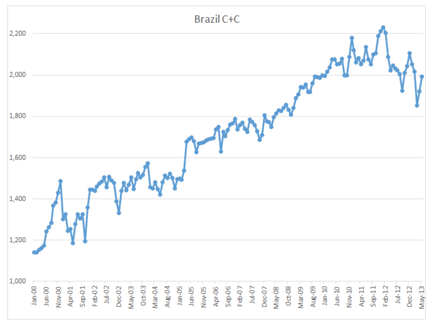 Brazil seems to be appearing in the news a little more regularly these days. Whether it is because the President objects to NSA activities or because Unilever is buying 3 million gallons of algae-produced oil from Solazyme, to be produced at a new plant in Brazil that will generate 30 million gallons a year, the emphasis has switched from a focus on their growing oil and ethanol economy, perhaps because it has stopped growing. Back when The Oil Drum first started (where the last post has now gone up) one of the earliest posts noted that Petrobras was seeing a 14% increase in production, as they reached 1.82 mbd, back in May 2005. 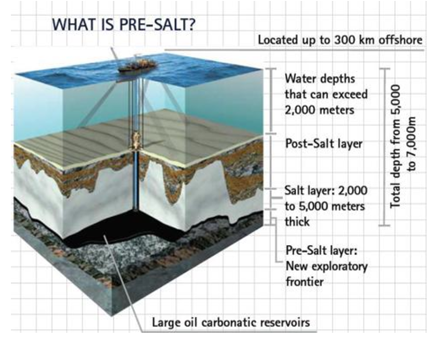 This was at the time that discoveries were being made offshore in what is now known as the Pre-salt deposits. Part of the problem with the development of these deposits comes from where they are and what they are. Rock salt is one of those materials that will flow under pressure. (One of the more interesting examples of this is in the Polish salt mine at Wielicza where old mining tools were found encased in salt in a region of the mine that was thought to have never been worked.) This poses some problems with drilling – although these are now relatively well understood. The other problem is that the reservoir rocks under the salt are recognized to be very weak, which makes it more difficult to drill long lateral holes, and keep them open. (The genesis of the basin has been described by Schlumberger). Note: this post has been updated to include the new discovery in the SEAL-11 area. 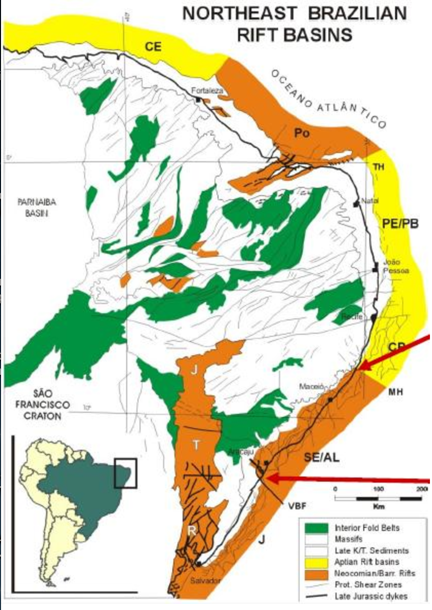 Exploration first found the Espirito Santo, Campos and Santos basins and this was followed, in 2006, by the Tupi province which held the promise, at the time of discovery, of producing 8 billion barrels of light oil and natural gas. Because of the location offshore the oil and natural gas would be recovered using a Floating Production Storage and Offloading unit (FPSO) and the first of these to be dedicated to the site was contracted in 2009, the first crude being produced in May, 2009. An earlier FPSO, the Cidade de Sao Vincente, was already in use as a test platform for the field. 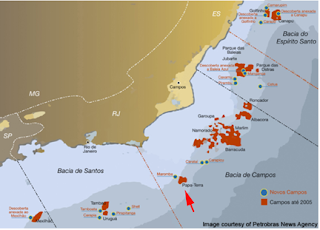 At the same time further development showed that three offshore fields (Tupi, Iara and Guara) held the potential to supply up to 40 Tcf of natural gas. Guara was discovered in 2008, and was initially anticipated to have 1-2 billion boe potentially available. Iara was also discovered in 2008, and holds a potential 3-4 billion barrels of light oil and natural gas. By the end of 2010 the collective potential for the three fields was estimated at 10.8 billion boe. A second FPSO was ordered in June of 2010 with a capacity of 120 kbd of oil, and 5 mcf of natural gas. Initial production from the first FPSO, the Cidade de Angra dos Reis, began in October 2010 with a target of 100,000 bd, and an additional eight FPSO’s were ordered in November of that year, increasing capacity by up to 150 kbd each, although collectively they are anticipated to reach maximum production in 2017 at 900 kbd. 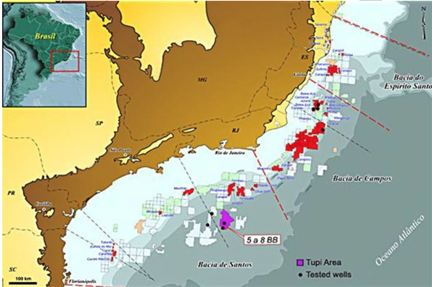 At the end of 2010 the Tupi development had been renamed as the Lula field, in honor of the retiring President, and two more FPSO’s were chartered to increase production by another 150 kbd each, from the fields of the region. By May the first well connected to the FPSO Cidade do Angra dos Reis was producing over 28 kbd as the first of six wells connected to the platform. 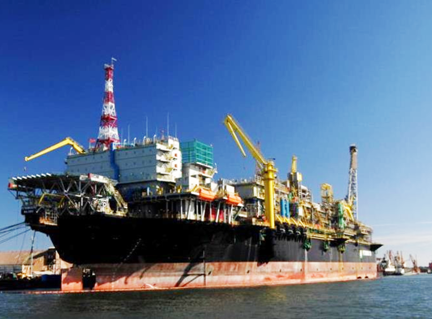 As the development of the platforms to commercial production became closer Petrobras also commissioned the construction of 2 more FPSO’s, noting that these would be able to inject some 200 kbd of water back into the formations, in order to assist with production and the maintenance of pressure. By June of this year the first production was received on the Cidade de Paraty a third FPSO, although only at 13 kbd, rather than the target 25 kbd as the vessel and support structure was still in process. The platform will ultimately receive oil and gas from 7 production wells (for a total capacity of 120 kbd) while feeding water back through 6 injection wells. The potential is thus evident for Brazil to become a significant producer to meet not only their domestic demand, but also to start exporting oil and natural gas, given the potential for these offshore fields. But, to date, this promise has yet to be fulfilled. Ron Patterson has been plotting production and I have taken this plot from his site. As I noted last time, the EIA had been projecting that Brazil would be producing up to 2.8 mbd by the start of this year, rising to 3.0 mbd at the end of the year. The OPEC MOMR suggests that they will only make 2.67 mbd by the end of this year, but at the above chart shows, that would still be a considerable improvement, and reverse the drop. The gain is anticipated to come from the FPSO Pappa Terra, which is the renamed Nisa, and which will be moored at the Pappa Terra field. This is in the Campos Basin, and is a heavy crude (API 14 – 17 degrees) with the potential to yield 380 million barrels. The vessel left China at the end of last year, and was completed in Brazil before sailing to the field in June. On the other hand Brazilian production of ethanol had gone up by 6%. 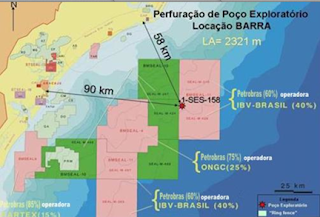 UPDATE: Just after I had finished writing this Reuters carried a story which they had pieced together from other reports, and which indicates that Petrobras and an Indian partner have found a new large field of light crude about 1,000 miles north of the developments in the Lula area. The new discoveries have the advantage of not being covered with the salt layer, and so will be easier to develop. Currently production is anticipated for 2018. 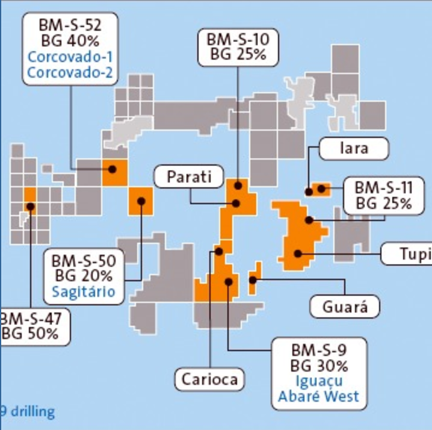 There are a number of different development wells being drilled in the region, and they have found sufficient success to allow their results to be congregated into a field with a potential reservoir of 3 billion barrels of light oil. of which perhaps 1 billion will be produced.